Your hardscapes should be the red carpet to your property. WET’s Soft and Pressure Washing delivers driveway and sidewalk cleaning that lifts the curb appeal of your home or business. That “red carpet effect” is great for your property, but there’s a catch: Many issues stand in the way. Hardscapes are, by nature, high traffic areas. Their main purpose is to be a thoroughfare between the rest of the world and your property… And the impact isn’t necessarily subtle. A negative impact is typically associated with these issues, with some of the biggest problems including decreased curb appeal and poor hardscape quality. Our team uses a special pressure cleaning system to protect your driveway and sidewalk from bringing the rest of your property down. Your concrete and asphalt is facing stubborn issues. The best way to combat it? 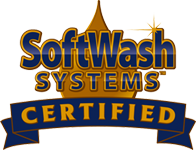 A high-level pressure washing system, delivered by qualified professionals. With our exceptional service behind you, your property’s hardscapes will be a hit for residents and customers alike. Stain-free, safe, and ready to impress. For us, our customers are friends – and we always treat your property with the hospitality, care, and quality that it deserves. If you’re putting your home or business on the market, a solid first impression will boost the selling price of your property. Potential buyers are heavily influenced by curb appeal, and clean hardscapes set a great standard. Your client-base – both existing and potential – are more likely to stay loyal to a business that keeps itself looking professional. Buildup on high-traffic areas can contribute to slip and fall accidents. As the leading cause of emergency room visits each year – and a significant liability for property owners – it’s important to take steps to prevent unfortunate incidents before they happen.